When then 19 year old Billy Strings moved to Don Julin’s hometown of Traverse City, Michigan, some friends told Don to ‘check this kid out’. He did, and after the performance introduced himself to Billy and suggested that they get together and pick some time. After a single rehearsal the duo has been playing a mix of traditional and original bluegrass tunes all across the country. Billy began playing guitar when he was 4. His father would play Doc Watson tunes at parties and family gatherings and Billy learned guitar so he could play along. Today he is 21 and considered a musician to watch in the folk/bluegrass world. Don Julin has mastered the mandolin and his skill on the instrument combined with his knowledge of the music business world really makes the duo work well together. They were recently signed by Crossover Touring. 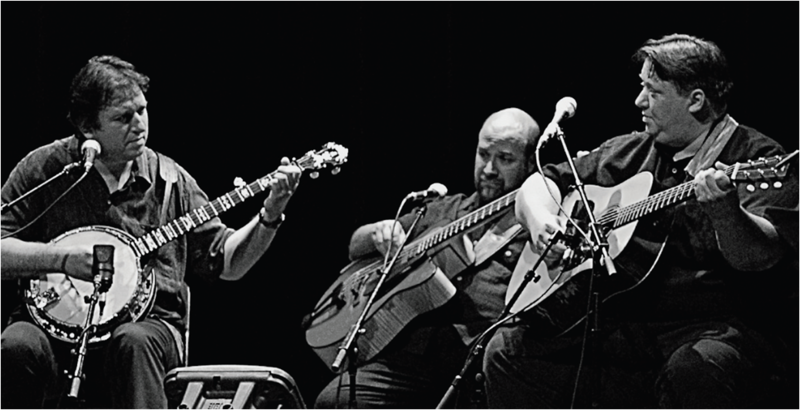 Their show is full of energy – the mix of Billy’s extraordinary picking, his powerful voice (mature beyond his years), Don’s mandolin picking and harmonies, and the chemistry between the two musicians – leaves the audience wanting more. Below is an audio file of “Beaumont Rag” from their 2014 release “Fiddle Tune X”. To RSVP check in with Tim at 717-940-9311 or by email at tlehman9@gmail.com. $15/20 donation at the door. Potluck at 6 pm, Show at 7 pm. If you know someone who can’t get enough of great guitar and mandolin picking, or extreme sports, make sure you bring them along. Billy Strings and Don Julin play “Walk On Boy”, a Doc Watson tune. Billy and Don will be playing at Chestnut House Concerts on Saturday, September 27, 2014. Potluck at 6:00 pm, Show at 7:00 pm. On Thursday, July 24, 1975 my brother chopped up my musical clock while mowing the lawn. In his defense, our grass did get pretty tall between cuttings; a well manicured lawn was not a priority on our dairy farm, and truthfully, whoever had the clock last was more to blame. Before surmising that I have a freakishly powerful memory, please understand that my mother made daily journal entries for most of her life. It’s become a great fact-checking resource over the years plus great reading, even if you aren’t a relative. On the day following the musical clock incident we were traveling in a car that was low on gas and we ran out at the top of the last hill and coasted home. I was pretty sad about the clock. 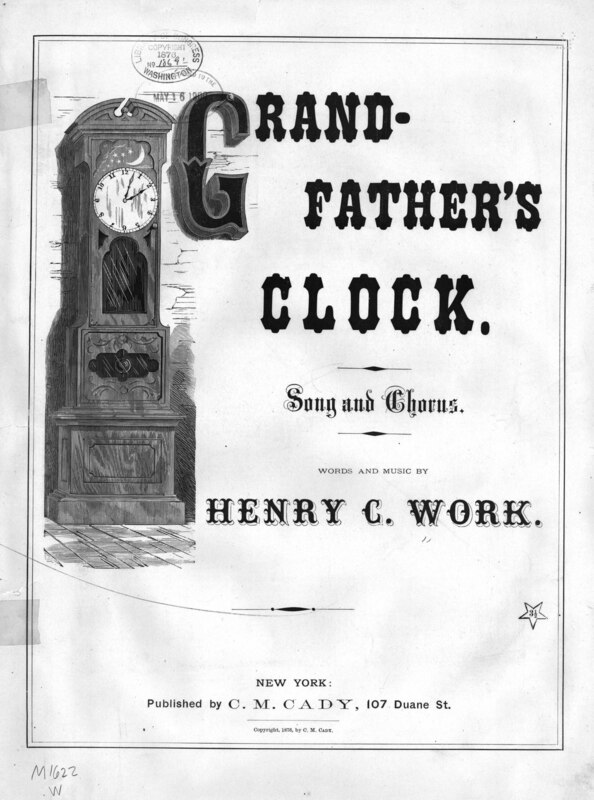 Although it only played the old 1876 tune “Grandfather’s Clock” over & over, I knew most of the song and would karaoke while other family members added the harmony. “…it stopped, short, never to go again when the old man died”. It takes quite a bit to impress an eight year old these days, but back then I was simply quite amazed that my chipped up clock continued to work. 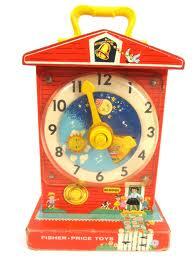 The dial in the back was still intact and the wound up clock still made music though it wasn’t visually appealing. I thought Fisher Price should know. Besides, I heard stories of other children who wrote letters to companies and in turn received free things and was inspired. My mother helped me write a letter to Fisher Price and I bragged about how my battered clock still functioned and how this toy must be very well made. I made sure to add how sad I was that this unfortunate event occurred. When mail addressed to me from Fisher Price arrived several weeks later, the envelope only contained a thank you letter, and sadly, no coupon for another toy clock though I purchased one years later at an antique market for memory’s sake. Our next scheduled show is the Krüger Brothers at 7:00 pm on a Sunday evening, April 7th. Many artists have covered “Grandfather’s Clock” including the great Doc Watson. Here is The Krüger Brothers’ version. We hope you can join us for this special house concert in the spring. At the April Verch house concert last week, someone asked about the upcoming show on April 7, 2013. I excitedly told them about the Kruger Brothers and how thrilled we are to host them at our house concert venue. Then came the logical question from someone who hasn’t heard the band, “What type of music do they play?” I struggled a bit. Bluegrass? Folk? Classical? Jazz? Natives of Switzerland, brothers Jens and Uwe Krüger started performing regularly by the time they were 11 and 12 years old, and began their professional career in 1979. The music of bluegrass greats Doc Watson, Flatt and Scruggs, and Bill Monroe made it across the ocean and influenced the brothers at a young age. Jens is known as one of the best five-string banjo players in the business. Joel Landsberg, a native of New York City joined the brothers in the early 90s and together they established the incomparable sound that the trio is known for today. I do know what I am talking about after all, and you can also trust me when I say, you don’t want to miss this show. Sunday, April 7, 2013. Potluck at 6:00, Show at 7:00. There’s no better way to end the weekend. Check the ‘About’ page on how to reserve a seat for the event.